These adorable cupcakes are fun and easy to make. 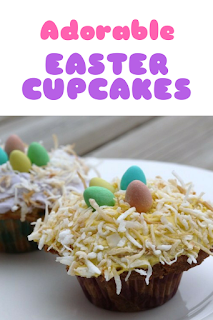 Vanilla cupcakes are frosted with cream cheese icing and dipped in toasted coconut to resemble a bird's nest. Then chocolate mini eggs are added to complete the Easter theme. Really, you can use any cupcake and frosting to make these, but I like the subtle vanilla flavour of this recipe. Preheat the oven to 350 degrees. Spread the shredded coconut on a baking sheet lined with parchment paper. I used a mixture of sweetened and unsweetened coconut, which was nice and not too sweet. Toast the coconut in the oven. Set the timer for 5 minutes and check it every minute after that so it doesn't burn. Once it is lightly browned, remove from the oven and toss it around. Let cool. Place the softened butter and sugar in the bowl of a mixer and cream it together with the paddle attachment on high speed until light and fluffy. Mixing on medium speed, add the eggs one at a time, then add the sour cream and vanilla. Scrape down the sides and mix until combined. Mix together the flour, cornstarch, baking soda and salt in a bowl. With the mixer on low speed, add the flour mixture to the butter mixture until just combined. Fill the liners until just below the top with the batter. Bake for 20 minutes then check by inserting a toothpick in the centre. If it comes out clean, they're done. If not, bake another 5 minutes. Once done, remove from the oven and cool on a rack until completely cool. I overfilled them a little so the tops of mine are huge! While the cupcakes cool, in the clean bowl of the mixture add the softened butter and cream cheese. Sift the powdered sugar and add it, along with the vanilla to the mixer. Mix on low speed until smooth. You can use the frosting as-is or you can colour it with one or more shades of food colouring. If you want to use different colours, remove half the frosting from the mixer and set aside. I used yellow and violet gel food colouring. Gel doesn't dilute the frosting, but you only need a little because the colour is vivid. Add a little colour to the frosting in the mixer and mix it until thoroughly combined and the colour is even. Remove the coloured frosting from the mixer, clean the bowl and mix the next colour with the remaining frosting. Once the cupcakes are cooled, spread with frosting. Dip them in the toasted coconut and arrange a few mini eggs on top of each. Cute little birds nests. These are lots of fun to decorate with kids. They look great and taste delicious. Enjoy, and Happy Easter!